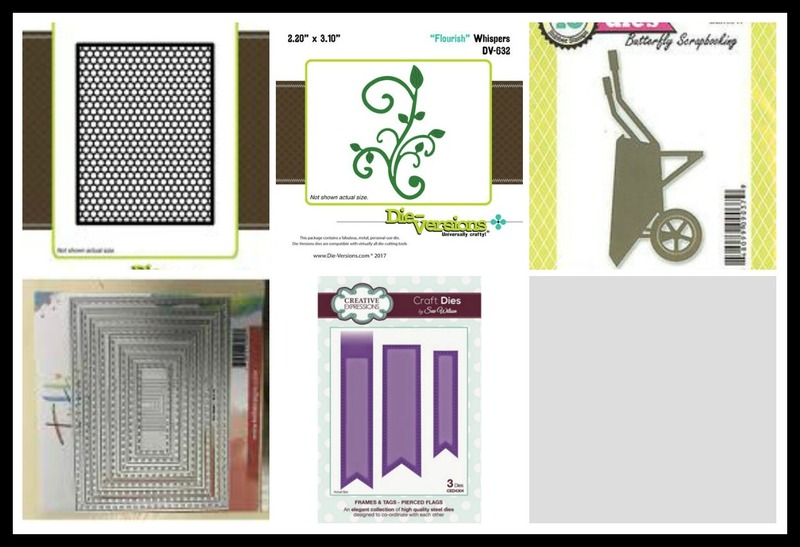 I started with papers from Lemon Craft~House of Roses for my base layer. I followed with the Die Version Whispers Hexagon Background and then with 2 panels using the Tutti Designs Stitched Nesting Rectangle Dies. The wheelbarrow is Impression Obsession Wheelbarrow Die and cut out in pattern paper and in foam for added dimension. I added pretty flowers from my stash and tucked in a pretty flourish using Die Version Whispers Flourish Die. The banner is Sue Wilsons Pierced Flags Die and the sentiment is stamped with My Craft Spots Butterfly Kisses stamp set (no longer in business). The pretty crinkle ribbon is pure love and red hot love from my friend Diana over at DL.ART. Sherrie, your cards are lovely! I love that wheelbarrow filled with flowers! 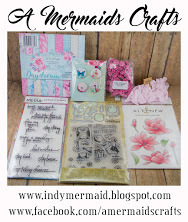 Great design using gorgeous papers. Adding the solid colors gives the eye a place to rest among the pattern--just a perfect balance and delightful to look at! Well done, my friend! Hugs! Two stunning cards! I love the garden scenes that you created on these two beauties! Love the colors of both cards! These are gorgeous! LOVING those wheelbarrows!!!!!!!!!!!!!!!! Both of these are gorgeous Sherrie. The red one really pops (guess I'm partial to it since red is my favorite color :-).) 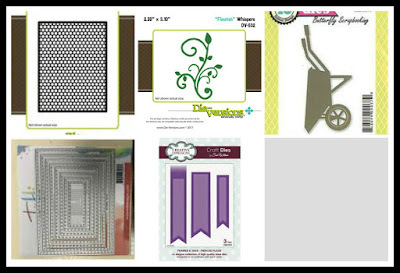 Great combo of die cuts too. Sherrie, both of these are so pretty. Love the wheelbarrow with flowers. Oh wow, Sherrie, these are absolutely stunning!! I love, love the layers!! The wheelbarrow is fabulous...adding that die to my wish list!! The flowers look amazing inside and I just love how you've used the House of Roses papers!! So elegant and gorgeous, my friend!! I love these!! These cards are beautiful! I love how unique they are with the wheelbarrow. Wow!. Both of these colors are stunning. Looks great! 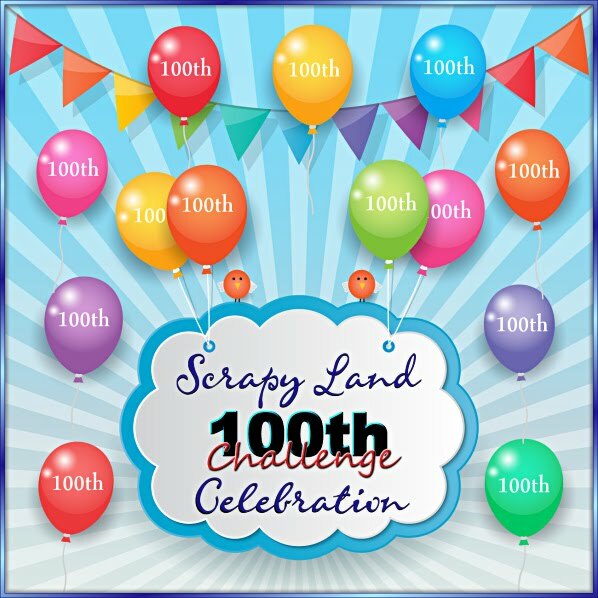 I need to check out Scrappy Land. I always seem to get side-tracked. I want to get some more dies, so this site seems to be the perfect place to look. 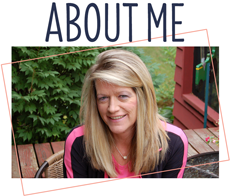 Hello Sherrie, your cards are both so pretty! 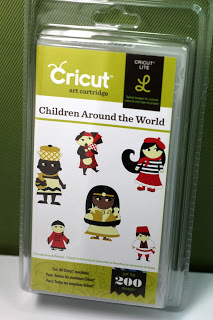 I love the die cuts and pretty embellishments! Gorgeous cards! I love the color combination of each of them! So many pretty layers you added to your cards! 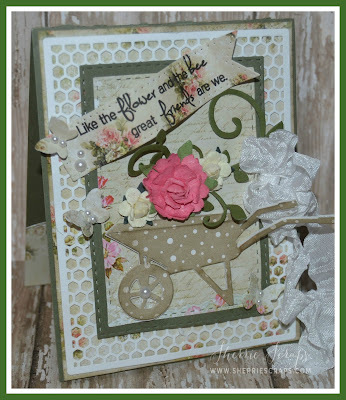 The flower filled wheelbarrow is amazing! Love, Love, LOVE these cards Sherrie!!!! WOW! They are gorgeous!!!!! Love the intricate beehive honeycomb looking die...such interest it gives! The wheelbarrow is gorgeous! Those florals and the ribbon are just so beautiful... you did an amazing job my friend!!!! LOVE it! Thanks for linking up in our FFC this week!!!! Both cards are beautiful. Fabuloiu papers and love teh wheelbarrow overlflowig with flowers. Hope you dad is feeling better my friend. So beautiful! That hexagon background is so awesome. I love how the ribbon hangs down like that so pretty! 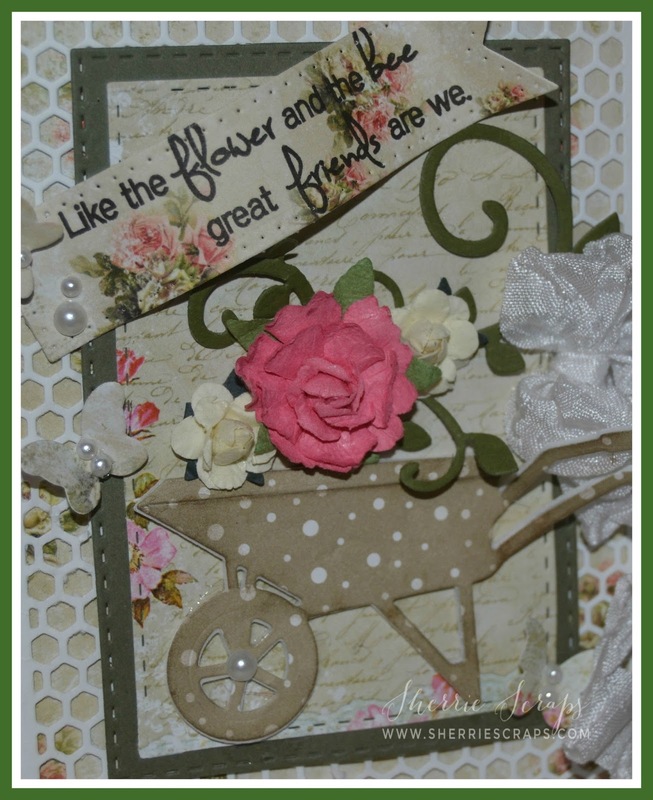 Love the pretty flowers on the wheelbarrow! The hexagon background is awesome!I love the gorgeous bows, pretty butterflies and fabulous papers. Just BEAUTIFUL my friend!One of my favorites!! Such beautiful cards, Sherrie! 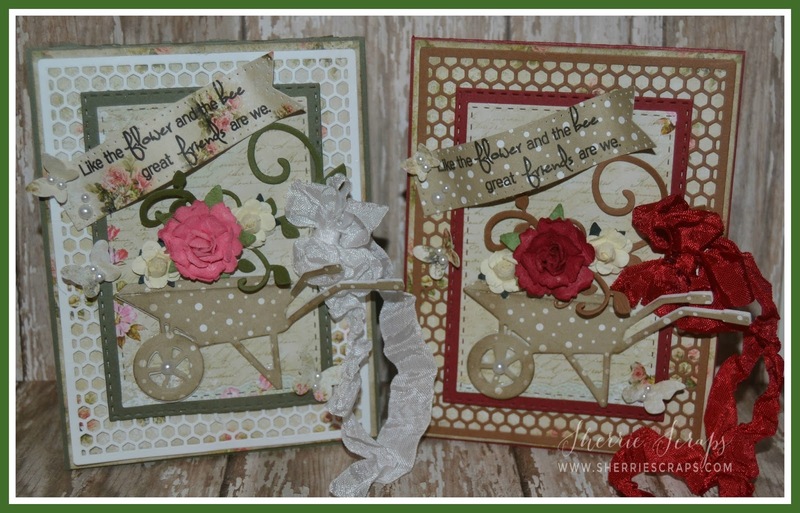 The hexagon background is such a pretty touch behind your lovely wheelbarrows! These are just stunning Sherrie! I love when you channel your inner shabby chic/vintage side! 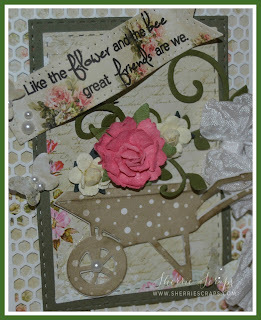 The honeycomb frames are fantastic, what a perfect design for a summer garden themed card! Your wheelbarrow full of flowers has captured my heart. My Mom used to have one in front of the house where I grew up, it's how I gave people directions. "it's the the house with the wheelbarrow planter out front". lol. Love the ribbon and the butterfly, and the wonderful sentiment as well. These are both just fabulous Sherrie! Thanks so much for playing in our ‘Flowers’ challenge at Dies R Us! Please come back again soon! Sherrie, your cards are beyond adorable! Love that little wheelbarrow and the way you filled it with gorgeous blooms! What a great design! Thank you for the inspiration. Your cards are awesome! I love the cute wheelbarrow filled with flowers...so pretty. Thanks for joining us at Dies R Us! Such pretty cards Sherrie! What fun wheelbarrows! Love the fancy blossoms and bows! Oooh, how fabulous! Look at all those layers and dimension! I love that sweet sentiment, and love those little wheelbarrows and flowers. That hexagon background is super cool, too. Really ties in that bee feel to the design! Oh Sherrie, these cards are simply lovely! 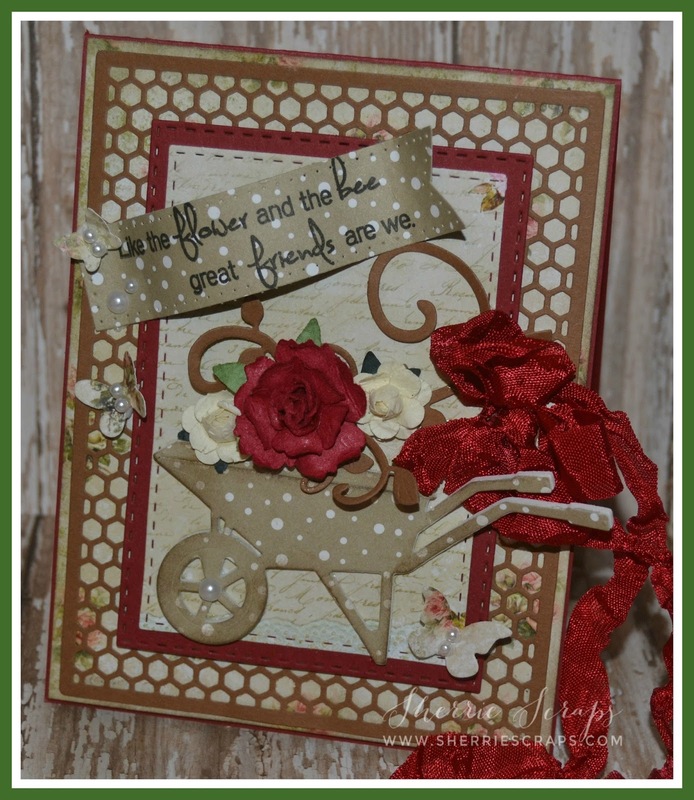 The wheelbarrows full of flowers are beautiful and that crinkle ribbon is fabulous! Gorgeous, gorgeous cards my friend! Sherrie your cards are stunning !